Myanmar’s progress towards peace appears stalled. Since independence, the military and ethnic groups, living at the margins of both the country and its power structure, have fought in some of the world’s longest running civil wars. In 2015, one of the major coalitions of ethnic groups, the United Nationalities Federal Council (UNFC), refused to sign the Nationwide Ceasefire Agreement (NCA); it has also issued nine policy positions, covering: humanitarian aid; internally displaced people (IDPs) and refugees fleeing violence; health; education; taxes; trade and investment; and three policies relate to natural capital: land, agriculture, and natural resources (see Annex 1). 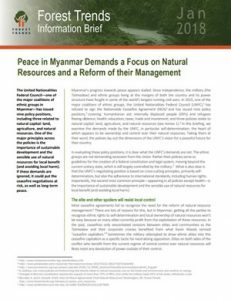 In this brief, we examine the demands made by the UNFC, in particular self-determination, the heart of which appears to be ownership and control over their natural resources.